The breast cancer survival rate rises if a patient has radiotherapy after having a lump removed, a study says. The five-year risk of cancer returning after a lumpectomy drops from 26% to 7% if the radiation treatment is used, a University of Oxford team found. The 15-year risk of dying from the disease also fell, from 36% to 31%, the Lancet reported. The cases of 40,000 women worldwide were studied. Some women reject standard radiation treatment, fearing side effects. These can include permanent swelling of the arm, damage to the shoulder and, occasionally, heart attacks or a new cancer developing in the lung or other breast. The study also showed similar benefits of radiotherapy for women who had their entire breast removed, but whose cancer had already spread to the armpit. The chances of the cancer coming back in or near the breast or armpit after five years dropped from 23% to 6%, and the risk of dying from breast cancer dropped by 5% to 55%. 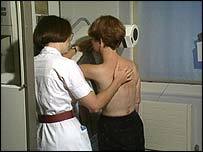 But researchers noted that for patients who had had a breast removed but whose cancer had not spread to the armpit, the benefits of radiotherapy were slight and were outweighed by side effects. Breast cancer is the most common cancer among women in the UK, with more than 41,000 new cases each year. More than 12,000 women die from the diease each year. Although rare, breast cancer can also occur in men. Researcher Professor Sir Richard Peto said: "This study provides the first really definite evidence that for women who've had breast-conserving surgery and for women whose cancer has spread to the armpit, radiotherapy reduces the long-term risk of dying from the disease. "The improvement is small but definite and it adds to the improvements in long-term survival produced by chemotherapy and hormone therapy." Dr Lesley Walker, director of science information at Cancer Research UK, which helped fund the study, said: "The findings will help doctors and patients with the information they need to weigh up the side effects and benefits when discussing the most appropriate treatment options." Emma Taggart, director of policy and campaigns at Breakthrough Breast Cancer, said it was already known that radiotherapy after a lumpectomy could reduce the risk of cancer returning. But she added: "These results demonstrate that radiotherapy may also improve long-term survival after surgery for some women."